FILE - The U.S. Capitol Building is lit at sunset in Washington, Dec. 20, 2016. A bipartisan group of lawmakers introduced legislation Wednesday to prevent the Trump administration from repealing sanctions on Russia without congressional approval. "The recent revelation of Flynn's secret conversation with the Russian ambassador on the subject of sanctions makes this legislation all the more important," ranking House Intelligence Committee member Rep. Adam Schiff told reporters in a press conference introducing the bill. Schiff was referring to former National Security Adviser Michael Flynn, who resigned Monday under pressure after it became public that Flynn had been in contact with Russia's ambassador before President Donald Trump's inauguration last month. 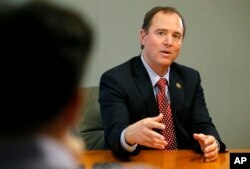 FILE - Rep. Adam Schiff, D-Calif., ranking member on the House Intelligence Committee, speaks during an interview in Washington, May 12, 2015. "If there were either condoned discussions that Flynn had or if he was acting as a free agent," Schiff said, "in either scenario, this president should not have the unfettered ability to eliminate Russia sanctions." Schiff said he would meet with House Intelligence Committee Chairman Devin Nunes later Wednesday to discuss an investigation into Flynn's contact with Russia as part of the committee's broader investigation into Russian interference in the election. Nunes told reporters Tuesday he was interested in investigating how the information about Flynn's phone calls was leaked to the media, but not the nature of his ties to Russia. The heads of the House Oversight Committee and Judiciary Committee also want the Justice Department to focus a probe on the leaks. "If it's going to be thorough, we're going to have to look at General Flynn, we're going to have to look at those transcripts and we're going to have to call him as a witness," Schiff said. 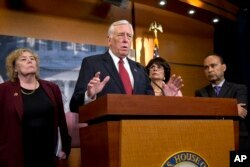 House Democratic Minority Whip Steny Hoyer said he believed there was sufficient bipartisan support to bring the bill to pass with a veto-proof vote. FILE - House Minority Whip Rep. Steny Hoyer of Maryland speaks during a news conference on Capitol Hill in Washington, Jan. 12, 2016. "Every American, every Republican, every Democrat is concerned about Russia and what they have been doing to violate international law," Hoyer said. "It's a serious matter of national security." Hoyer pointed to Trump's tweet early Wednesday as proof Congress is needed as a check on the Trump administration's approach to Russia. "Only Donald Trump could blame [former President Barack] Obama and not [Russian President Vladimir] Putin for Russia's illegal annexation of Crimea," Hoyer said. "That's hardly being tough on Russia." The House bill has bipartisan support, with Republican congressmen Adam Kinzinger, Tom Rooney and Mike Turner among the co-sponsors. It is similar to a bipartisan measure introduced in the Senate. At a news conference Wednesday after an emergency meeting of the Senate Democratic Caucus, Senator Charles Schumer warned that the magnitude of the Russian controversy cannot be overstated. "Our security is at risk," Schumer said. "This cannot be a time of partisan squabbles. Instead, it must be a time when both parties come together to protect the rule of law, the system of checks and balances and the security of the American people."